The Free Farm Stand and its supporters won. The stand will continue to give away free food to the community on Sundays from noon to 3:30 p.m. in Parque Niños Unidos. At the same time, it will coordinate with the Department of Public Health to obtain a health permit, Connie Chan, a spokeswoman for the San Francisco Recreation and Park Department, wrote in an e-mail. Rec and Park has issued a temporary permit for the stand to operate for the next six months. After that, it will re-evaluate the permit based on community feedback. The turnabout came after Rec and Park officials informed the Free Food Stand last month that it would have to leave the park at 23rd and Treat Avenue by mid-October. The department reported receiving four official complaints regarding the food give-away, one by phone and three by e-mail. Chan said that one of the complaints was from parents who were concerned that the crowd waiting in line for the stand had disrupted a children’s birthday party at the rented clubhouse. The stand will now be set up in a designated area to avoid congestion at the entranceway, according to Rec and Park. Other parents and children came to the defense of the stand and of Dennis “Tree” Rubenstein, who has operated it since 2008. Negotiations ensued and the agreement was worked out. “I already knew in my heart that Park and Recreation was not going to evict us from the park because of the overwhelming support from neighbors, and earlier in the week, Eric Anderson, park manager for our neighborhood, already assured me that they were looking for ways for this to work out that satisfied us both,” Tree wrote on the Free Farm Stand’s website on Oct. 3. 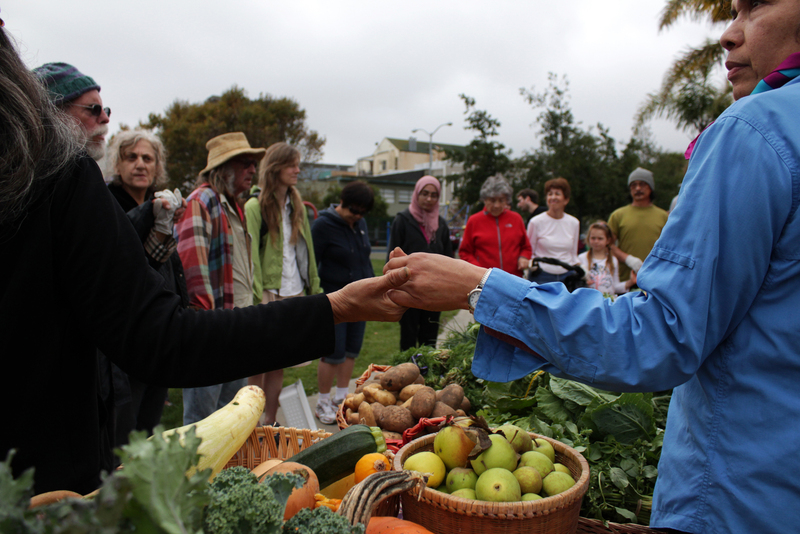 The community rallied around Rubenstein and the stand, expressing their appreciation for its free produce and community support since 2008. Tree has lived in the Mission since the early ’70s, and has been working in food education for as long. “My goal has always been to be educational and to encourage people to garden as a step towards ending hunger,” he said. For many neighbors, the stand is an important asset to the Mission community. Sarah Whedon remembered discovering the Free Farm Stand on a Sunday after moving from Boston. There, in the middle of a park on 23rd and Treat streets, volunteers were giving away fresh local produce to those in need. “We moved to the right place,” Whedon recalled telling her husband. Jack Brown, a father and nearby resident, didn’t understand the opposition. “As far as I can tell, it probably wasn’t parents of small kids, because it doesn’t infringe on the play area.” Brown visits the park several times a week and has never heard fellow parents speak negatively about the stand. Aware of the growing numbers in the Sunday line — more than 200 nowadays — Tree has incorporated a ticket system to keep it organized and to prevent people from crowding the stand. Tree said that he’s “always really conscious about environmental impact,” and sees the stand’s growing popularity as a sign of need. “It shouldn’t be just a certain class of people [that] should have access to this kind of food,” he said. Even when the stand operated without a permit, many nearby residents commended Tree’s dedication to feeding those in need. “He’s the guy who would feed the world,” said Carolyn Deevy, 71, who moved to the Mission in 1969. Many would agree, as the Free Farm Stand and the Free Farm received second place in the “Citizen of Tomorrow” awards sponsored by the Bay Citizen in May 2010. Sara Miles, director of the Food Pantry at St. Gregory’s Episcopal Church on Potrero Hill, said Tree is an expert in collecting excess food from neighborhood backyards and gardens, and that he and his volunteers provide an important source of fresh local produce to her nonprofit. Now that fall is in full swing, so is the last bounty of produce. On a recent Sunday, volunteers gave away more than 500 pounds of apples and pears sourced from trees in the Mission, Bernal Heights and Potrero Hill.